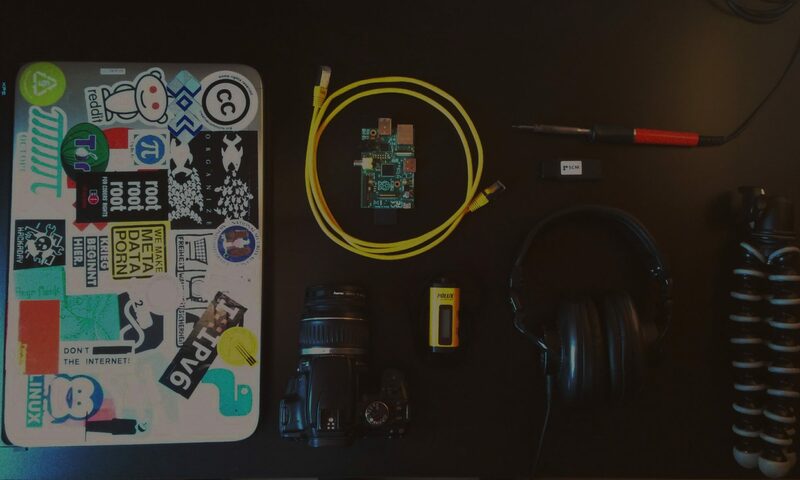 I wanted to document the steps that are necessary to transform the Adafruit Bluetooth LE Friend (https://www.adafruit.com/product/2267) to an passive Bluetooth 4.0 Low Energy Sniffer device. This sniffer can be used to monitor the bluetooth communication between 2 LE devices. Which makes it a useful and cheap tool for security research and development. The Bluetooth LE Friend comes in 2 versions – one with a preinstalled Bootloader, Softdevice and Application to control the on-board Nordic nRF51822 chipset using AT Commands. This Is already really useful for prototyping your own bluetooth applications. It supports OTA updates and Adafruit provides an Android application together with some demo projects. As mentioned, Adafruit offers the same hardware in a Sniffer version, which comes with custom Sniffer firmware from Nordic preinstalled. So, you own a BLE Friend, want to Sniff Bluetooth Traffic and don’t want to spend another 24$+shipping for the Sniffer version? Flash your BLE Friend! I’m using the STLink V2 SWD programmer (the white box). You need to connect 4 lines to it. Now, you need to connect those lines to the SWD connection pads on the bottom of the PCB of your LE Friend. Soldering them on is the fasted way in my opinion. Note that we don not need to connect the reset pin – the reset is done via the SWDIO line. For simplicity, you’ll flash the LE Friend using Adalink. 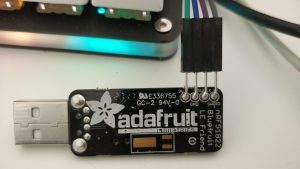 (https://github.com/adafruit/Adafruit_Adalink). Adalink is a python wrapper for OpenOCD that abstracts away the complexity of OpenOCD – which is good and bad a the same time. Save those files – you’ll need them in the next step. 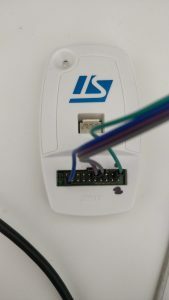 Connect your Programmer with your computer and Plug the LE Friend into USB – This powers the nrf51 – the programmer alone does not provide any power to the LE Friend. If everything worked, the Bluefruit LE should boot with the sniffer firmware after the reset and you should see the blue led flickering – this indicates that you were successful. The setup consists of 2 layers with 5 leds each. 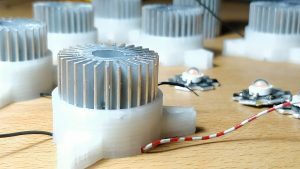 Those chip leds get really hot, so they need some heatsinks. 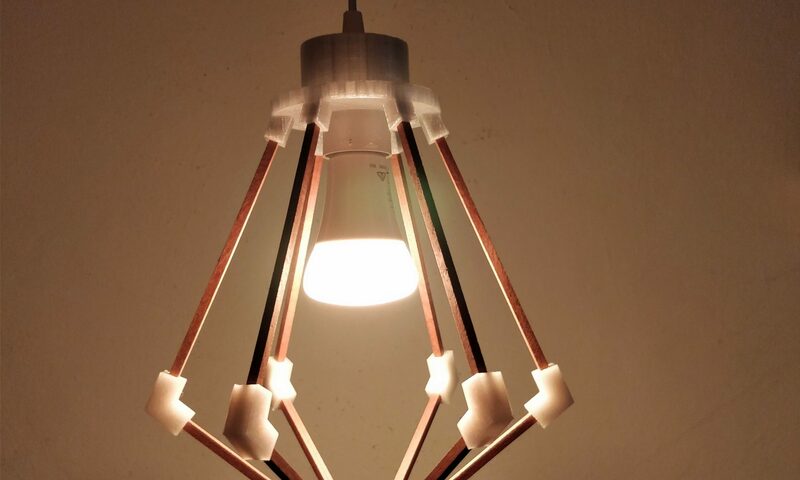 A 3D printed socket for the leds holds the heatsink in place. You can download the .stl here. …or how a broken authentication system could lead to corrupt transactions. David Kriesel, who presented the lovely talk about the Xerox Scanner Bug at 31C3, demonstrates how he used big data to determine internal structures of the Spiegel publishing company. Must see! 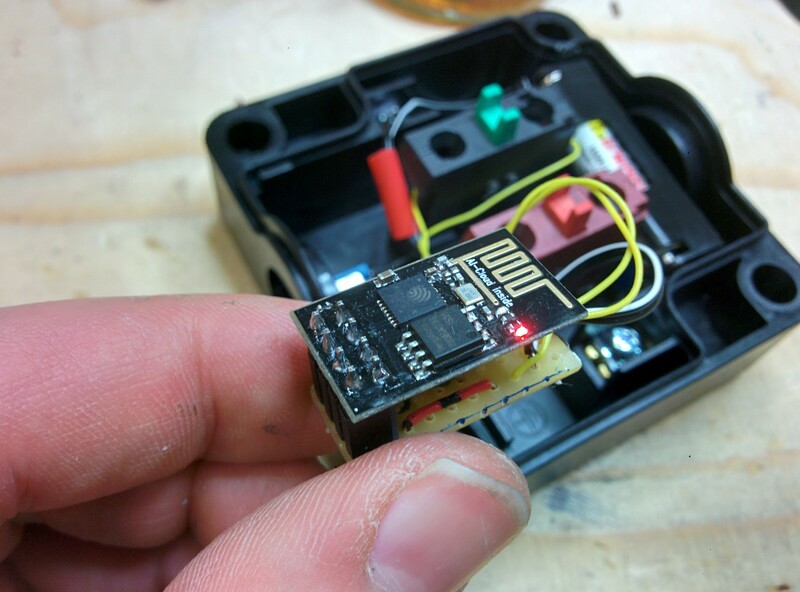 The ESP8266, which is used here, is a small, WiFi-enabled chip which can be programmed. I hooked it up to send web request to IFTTT to trigger actions. I started with a prototype on a ESP8266 NodeMCU development board. The button causes the ESP to send a web request to IFTTT, which is configured to send a push notification to my iPad in this example, but can trigger nearly any action that is supported by IFTTT. after testing the firmware on the development board, I flashed it on the chip and put everything together. IFTTT SmartButton from the inside.Tada! 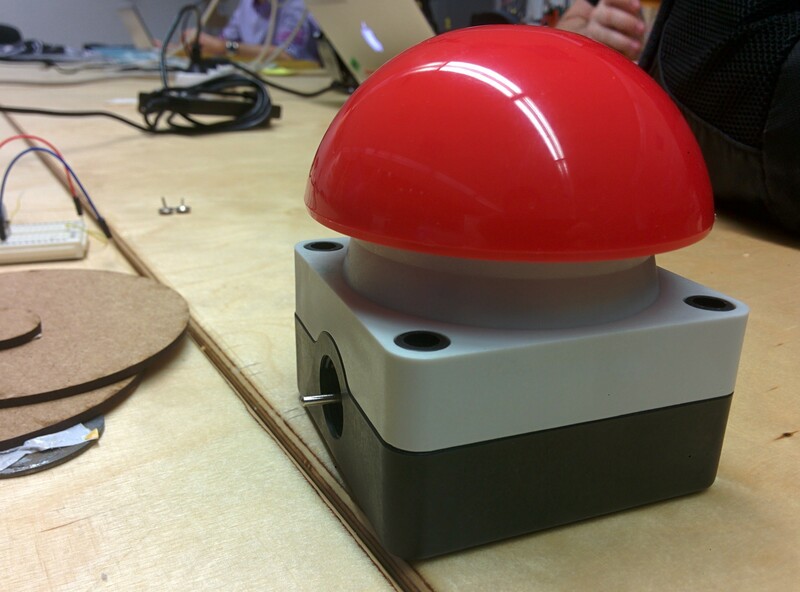 We do now have a battery powered push button for the internet of things. I did this small project on a summer weekend in 2015. I just saw the movie “the Social Network” where Marc had this idea of rating girls using an algorithm called ELO which is actually used for rating chess players based on their wins and losses against other players. Personally, I think rating girls is disgusting. But rating Bananas and Apples is fine. An I’m more interested in the theory and the Algorithm itself. So I thought, hm, how hard could it be to implement a system like this – turns out: not that hard. According to the rules of fantasy curling, there has to be a winner and a looser – a remi is not allowed. At the end of the day, you either won or lost. The outcome of the match will affect both players ELO ratings. The more unlikely the win is, the more impact on the overall rating table this match will have. Let’s have a look at both possibilities. R_A and R_B are the current “pre-match” ELO ratings of Player A and Player B.
E_A is a value between 1 and 0. The 400 you see here is a historic value chosen by a guy named Arpad Elo and is since used for the chess rating system. Surprisingly, fantasy curling uses the same value ;-). But feel free to modify it. So you lost against Player 2 with a rating of 61, which leads to the E_A value for you of 0.4555054269169921. (This is close to 0.5 wich would mean that the parameter 400 is not idea, but works for our example. I would suggest choosing a smaller value if you working with ELO ratings that close to each other.) According to the rule, your opponent has an E_B of 0.544494573083008. How does that value generate the new ELO rating? Your new ELO number will be your current rating (30) plus a factor k (assumed 10) multiplied by the difference of the S_A value (0 , because you lost, 1 otherwise, 0.5 for a draw, which does not exist here) and your just calculated E_B value: 25.444945730830078. Player 2 now has a new ELO number of 65.55505426916991. The k factor defines the impact of the match on the game. The higher the k is, the more impact it has. You can also fine-tune here. The impact of the match on the table is defined by the constants k, the constant value 400 and the point difference of the opponents (which is variable). The whole systems is based on the simple assumption that games between a higher rated player and a low rated player are more important and have a greater impact on the result. This allows new players wich usually start with an average value to climb up the ladder very fast. Similar to our example, Facemash also some kind of system with rounds where 2 opponents can either win or loose a match. Every element starts with a basic value of 2500 rating points. As a user, you now decide who wins the round and the ELO algorithm decides the new value. Matchmaking is implemented to be random. It’s a very simple way to get elements in some kind of order. I was actually surprised how well it works. The face mash clone is written in Python and uses Flask as underlaying framework. 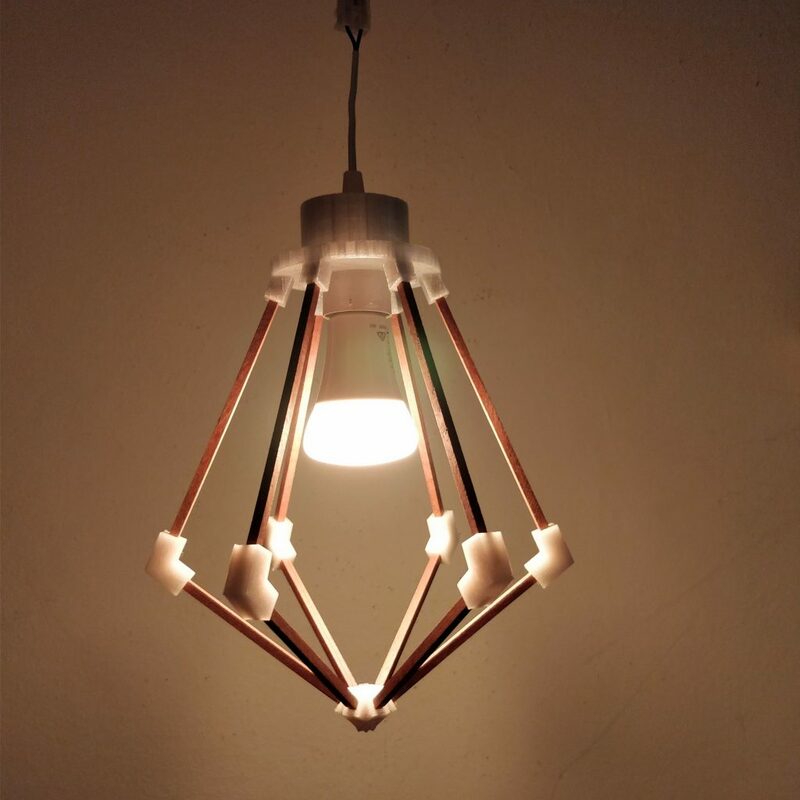 Check out the project on my GitHub – it’s open source. the Secret Santa Project was one of my favourites during the time at university. It’s a kiosk-like service for sending anonymous SMS messages with the goal to surprise your friends with a chocolate santa. The chocolate part makes it even better. At university, I was a volunteer at our local UNICEF university group. In winter semester 2013, we had the task of doing a project that has something to do with Christmas – and in the group we came up with a little game: The original intention was to create a kiosk like interface, which students can use to send anonymous messages to a fellow student and inform them, that he or she just received a little present (we got some chocolate form our sponsor). Let’s assume you want to suprise your close friend – she’s still stuck in a boring class about business administration. Every message will be logged in a database, but only be marked as ‘sent’ when we know the message was sent out successfully. She will receive the message via SMS or email including a pickup code! This message is anonymous and will not contain the name field. Even if you entered your name in the sender-field. They will then type the ID in the searchfield and set the checkbox ‘delivered’. TADAAAA: you just sent an anonymous secret chocolate santa! 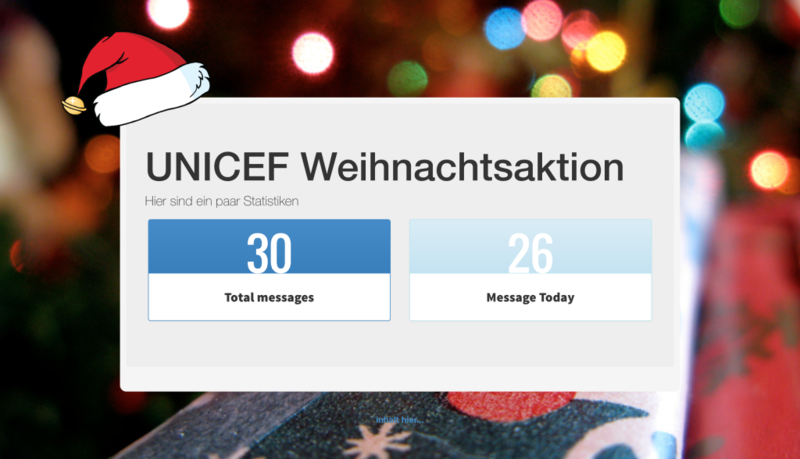 Every message sent out contains a 4 digit pickup code (the lenght is configurable btw). We now did this project a couple times and It was totally worth it – besides It was a great learning experience, we had a lot of fun planning the events. 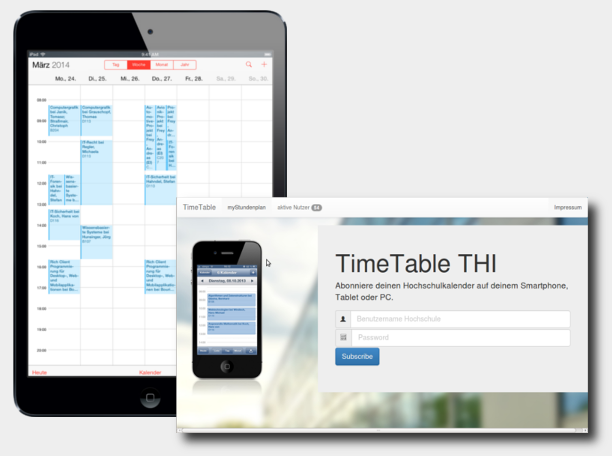 THI Timetable is the inofficial Timetable for Students of Technische Hochschule Ingolstadt. 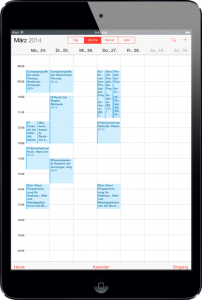 It brings your schedule to any device via iCal without having to install an App – you can use your native calendar application! 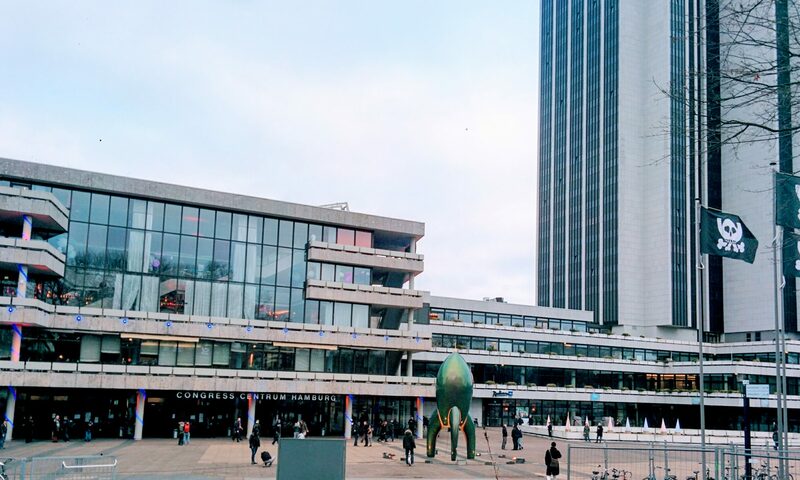 Although the university provides a working system, it lacks important features like export or sync functionality. Additionally, the usability is poor: It is written with JSP, making it slow. 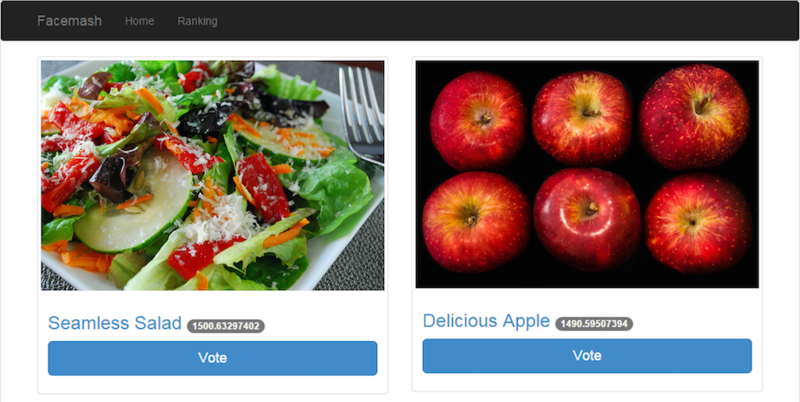 Another Problem is the layout, which is not optimized for mobile devices. The most annoying aspect of this system is, having you to sign in each time you want to check your timetable. 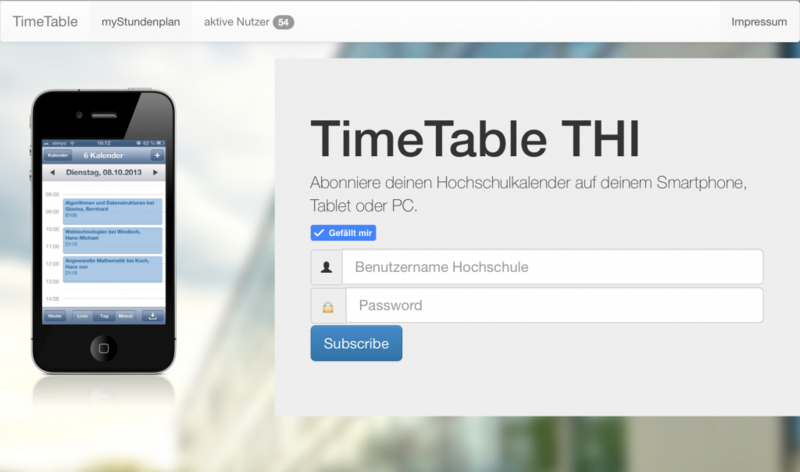 This is the landing page for the TimeTable Project – you can subscribe with your university credentials. Next step is to feed it with username and password and it will send a request to the hiplan-app, parse the result using a regular expression and return the session-id. Now we are logged in, we can dig a little deeper. The hiplan-app uses Ajax to load background-data which turned out to be valid JSON. Fancy! Next we have to parse it. We just transformed the event-jsons to objects, so we can use them to export to any format we want – in this case iCalendar-Format. There is a nice python-library called icalendar which gets the job done. So – next step is to combine all these results and create a first version as a commandline tool. It is available on Github. Just have a look at the examples. So I decided for the Webapp. I hosted this service on Googles AppEngine, since it includes everyhing I need: a Python-Webframework called webapp2 that comes with a jinja2-like template system, a data storage which is needed to hold the user data and last but not least probably the most important part: A cron-service to schedule tasks. The system is build on a polling mechanism to scrape the calendar data from the hijacked api, therefore I needed the cron-service to schedule the update-tasks. This is the way I want to check my daily schedule!